Here is the list of best free Soundboard Software for Windows, which you can use to create a soundboard of your own. You can use these free Soundboard programs to add your soundtracks from your PC and mix them up. Some of these even have a database of their own and also an audio mixer that you can use to show your creativity. You can even Save your soundboard with most of them. You can add and mix various funny, scary, or some awesome soundtracks from different albums. Some of them even let you play online audio tracks and mix them with others as well as save them. As you know, Soundboard software are widely used in Radio Stations and Clubs, you can be your own RJ/DJ by using these software. In this list, I prefer Jingle Palette the most as it supports multiple sound palettes to create different soundboards. I was able to add my favorite soundtracks (both from my PC and Online) and use this audio mixer program to mix them up. The Timer feature of this freeware is an awesome option as the audio file can be played at the specific time. The advanced features it supports are quite similar to an expensive soundboard software that professionals use to play in Clubs or Radio Stations. It apparently gives you a feel of a professional soundboard handler and with constant practice it will surely make you an expert in audio mixing. You can also check out the list of best free DJ Software, Media Players and Anti-Keylogger Software. EXP Soundboard is a free soundboard software, with which you can easily create soundboard of multiple audio files. With this freeware, you can mashup the added/loaded audio clips together. 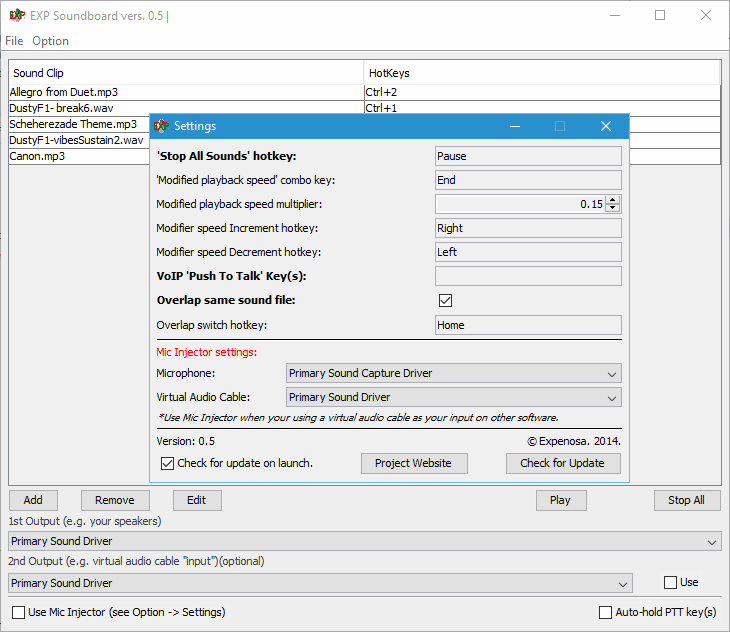 To use this free soundboard application, you must install JRE Runtime environment (version 7 or later) in your PC. As I mentioned, you can add multiple audio files to create your own soundboard; you just have to click on Add File button and add the selected multiple files. The added audio files can be selected and played with Play button. You can even assign a Hot-Key of your own choice for each audio clip in your list and press the particular Hotkey of an audio clip to play it instantly, thus creating a mashup of various audios. All the audios being played can be stopped with Stop All button or with its respective assigned Hot-Key (Pause by default). For your ease, this free soundboard features various settings that can be applied for a creative mixing of loaded audio files and you can use them to Modify Playback, Speed Set Hotkeys to, Push to Talk, Overlap Same Sound File, and Mic Injector settings. Although I didn’t try mic injector option, I guess it would be useful in in hands of someone who want to use it professionally. You can even set various audio levels for Primary Output Gain, Secondary Output Gain as well as Mic Injector Gain. Besides all these features, this free soundboard software also supports Audio Conversion to WAV and MP3 format. You just have to load the file, select the format in which conversion is to be carried out and convert it. It means that even if you have an unsupported format of audio file, you can still convert and add it to this freeware for your purpose. I feel that this is quite a cool feature of free EXP Soundboard software. You can surely use this soundboard program for PC. 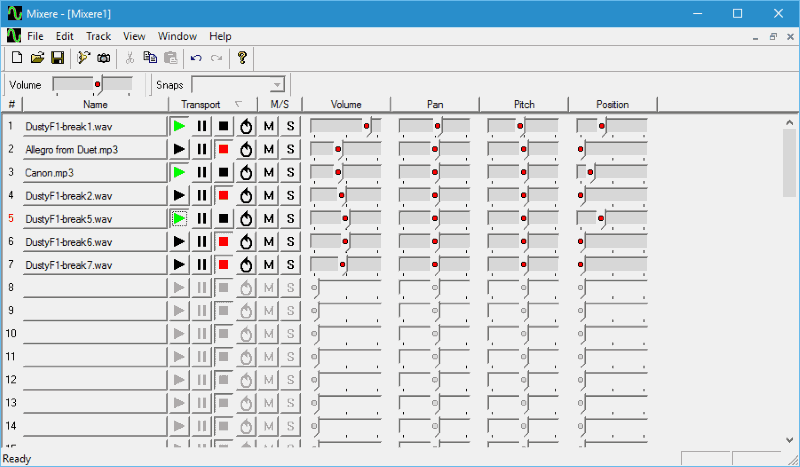 Jingle Palette is a simple yet very useful free soundboard software. You can use it to play added or pre-loaded multiple or single soundtracks, mix them up or set them in a loop and even play them at a particular time. It features 2 set of sound palettes with each set consisting buttons with a soundtrack/jingle attached to it. You just have to click corresponding button to play the soundtrack. You can also attach your own jingle to an empty button, if you want, with a right click on it or from Assign Jingle option on the interface. An audio clip with MP3, MP2, MP1, OGG or WAV can be added easily to the empty button. You can also toggle to next and previous palette with its respective buttons. These Audio buttons when pressed play their respective soundtrack and you can play another jingle at the same time. In this way, you can mix as many soundtracks/jingles as you want and save them with Save Current Palette option for future use. You can also Stop and Empty a palette if you want. The set of played jingles can be set to Autorepeat after their playback is complete or Automixed together. There is one Touchplay button by which you play a jingle till the time its respective button is pressed. You can press Stop All button to stop all the playing tracks at once. If you use AutoPlay, then TouchPlay will be turned off, and vice versa. One peculiar feature of this freeware is that you can Set Timers for a particular jingle or a set of jingles to be automatically played. For this, you just have to assign the time and the particular jingle from Time Announce option. Another good feature is Playstream option which lets you play an online audio file as well as automix that file with other jingle by adding its respective URL. You can assign a particular Volume level with Assign Volume level to Jingles for a particular set of jingles. For this, you just have to individually select a jingle and set the level of volume for it. This is very crucial feature for sound mixing and professionals use this feature well to create a masterpiece mixup of soundtracks. I will say that you can use this free soundboard program to mix and play various soundtracks just like an RJ does. Mixere is a free soundboard software that you can use to load various audio files and mix them to create awesome audio-mix soundtracks. It features numerous tools and options for audio playing and mixing purpose. The interface of this free soundboard program seemed a bit complex to me but once I figured out its options, it became quite easy for me to load different audio files and mix them up. A single soundboard of Mixere offers upto 67 blocks, where you can load your audio files. You can easily load an audio file to a block with a right click and select the load audio option or the same can be done from the File menu. For each block its respective Transport, M/S, Pan, Pitch, Volume and Position options are available with their respective Hot-keys (in the Menu Bar). You can use the Slider bar for these options to adjust the playback of the audio attached in the block as well as mute/start them too. Just imagine, what can you do if you load multiple audio files in these blocks to play and mix them as you want. You can also play two soundboard files at a time as XF, it means that one will be selected to play in the foreground while the other will play in background simultaneously. One awesome feature I encountered while testing this freeware is that it lets you take snapshot of the current soundboard. It means that you can record audio files and their status at a particular instant. Basically what this feature does is that it makes a restore point of the soundboard. With this feature, the recorded snapshot for a particular board can be restored at that very point if needed. You can easily use this feature to rectify any mistake you make while mixing up audio files. Another thing with this freeware is that you can always Save your soundboard and snapshots whenever needed, but the only limitation is that the file will be saved in MIX format by default. Although I am not a professional in audio/soundmixing task, still I was able to create a soundboard of my own and mix and save various audio files together. You too can surely use this freeware for the same purpose. Soundboard is a free software which lets you create your own personal soundboard of audio files. It has a simple interface which you can easily understand and use. It offers 16 sections in which you can add different audio files at a time but you can add only WAV audio format as this is the only format this freeware supports. To add an audio file to a section, you can either browse and select the file or just drag and drop the file to that particular section. Let me tell you that once all the sections are filled up, you cannot add more audio files. If you still want to add a sound track, then simply empty a section and add the desired sound track. Once the soundtracks have been added, you can play them individually with a click or use the Loop button to select and play the added audio tracks in a Loop. You can even control the volume of the playback with Volume button. You can save the list of added audio files as XML as well as load a previously saved profile and play it again. It features a Debug option which lets you view detailed log of added/removed audio file. Besides all these, it features some options with which you can set this freeware to show in Taskbar, Minimize to System Tray, Clear Sound before profile load, Change button font size, and Change Opacity. Although this free soundboard software doesn’t support sound overlap or mixing features, I will say that for creating a simple soundboard of your own, it can be used. Silica Interactive Soundboard is a simple soundboard program with which you can make a basic soundboard of your own. This program doesn’t support features other that adding jingle/audio files and play them individually. Being a basic soundboard program, it has the simplest soundboard interface I tested so far. This standalone program opens up to display an interface with only a single option “File” and an Empty RED button tagged with number ‘0’ on its board. At first glance I was pretty much confused that how this program will work. 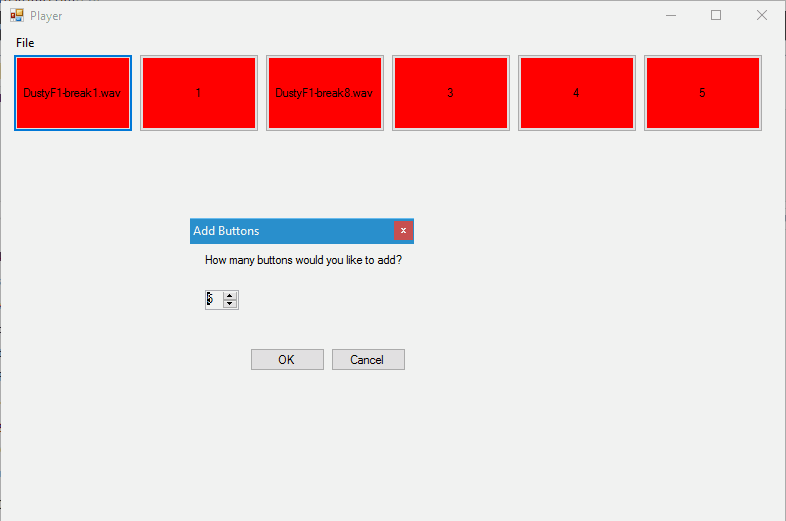 But when I right clicked on the board it displayed options to Add Button and Add Multiple Buttons. Now with the new buttons added, you can easily assign soundtracks to them but only audio files WAV format are added. If you will right click on a button, you will see various options, which are: Select a new Song, Select a new text, Delete this button, Bind a key to this button and Show Index. Now as you can easily make out what most of these option above can do, let me enlighten you about “Bind a key to this button” option. With this particular option, you can assign a key value (numeric value) to a button and by pressing that Key you can add a soundtrack (if empty) and play soundtrack without clicking it. If you want, you can save the current soundtracks from the File option and Load a previously saved file too. I would also like to tell you that this freeware has a bug too, that is if you cross the limit (41) of new added buttons, you cannot access them as the scroll bar feature is missing. 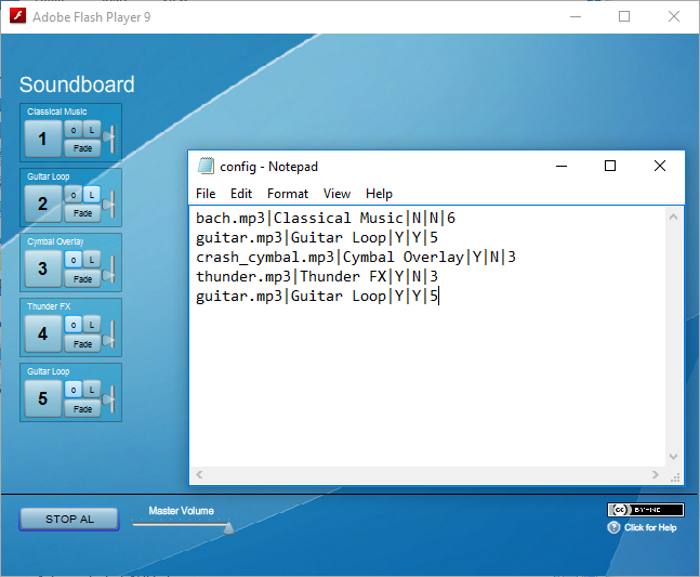 I will say that you can use this free soundboard software for creating a simple soundboard of your own even some other good soundboard software is not available or to learn to make a soundboard at beginner level. Soundboard is a free soundboard program that you can use to create a simple soundboard of your own. It requires a flashplayer to work. You can use this free flash player powered soundboard program to add and play the audio files of your own choice; however the procedure is a bit complex and needs a little understanding. As the interface of this freeware displays only 4 sample buttons by default with no other option to add any audio clip, it becomes a bit difficult to use it. To add an audio file, first of all you need to copy the audio file to the original file folder (extracted) of Soundboard software. Copy and paste it in the last. Copy the name of the added audio file and replace the ‘filename.ext’ with it. Save the file. Restart the program and you will see that your audio file will be added in the interface. Let me tell you this that the soundboard you create will be available as such the next time you open it. If you have to create a new soundboard, you have to remove the audio files from the soundboard folder and also make changes in the config file. In this way you can add up to 36 different audio files to the interface. Each audio file is added with its respective numbering ordering. You can click on the number to start/stop the audio file. Multiple audio files can be played simultaneously by clicking at their respective buttons and you can choose some or all of them to play in Loop with their respective Loop buttons. A Stop AL button is also displayed to stop all the playing tracks along with a Master Volume slider option to slide and set the volume of all the audios being played. 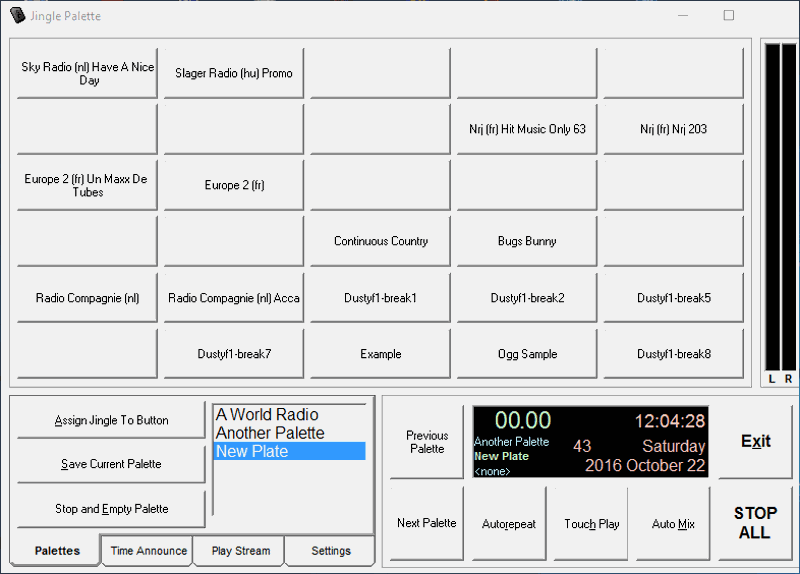 You can use this freeware if you don’t find any other good soundboard software available, as it doesn’t have much features and the configuration process is a bit hectic too. 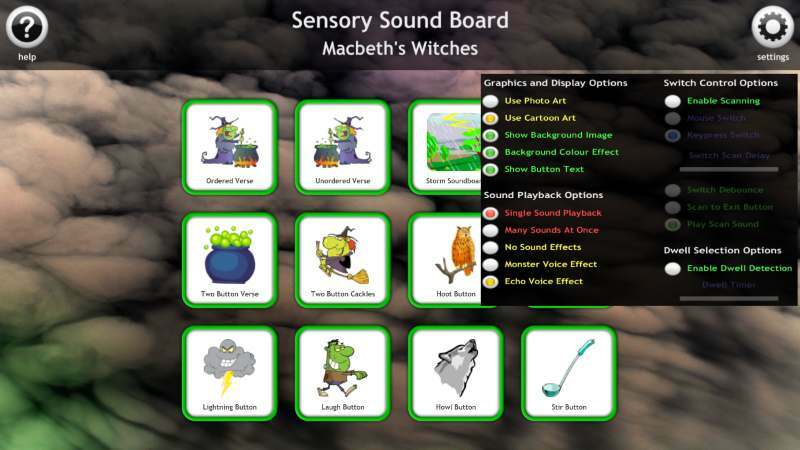 Sensory Sound Board is a free soundboard software or better call it a soundboard application, with which you can play various scary sounds. It consists of a default Soundboard of various scary audio clips that can be used to play pranks or setting a playback theme for a Halloween party. It has an interactive interface, which displays numerous scary icons representing a particular category. When you click on an icon it further opens up and displays various icons with their respective scary Audio Clips attached to it for you to play. The icons categories are: Ordered Verse, Unordered Verse, Storm Soundboard, Two Button Verse, Two Button Cackles, Hoot Button, Lighting Button, Laugh Button, and Howl Button. You can even change the display of these icons as cartoons or simple pictures as per your wish. It offers some settings for Graphics and Display Options, Switch Control Options, Dwell Selection Options, and Sound Playback Options. As you can use this freeware to play various scary sounds, the Sound Playback options lets you use various sound settings which are: Single sound Playback, Many Sounds At Once, NO sound Effects, and Echo Voice Effect. I will say that if you want to create a scary sound effect, this free soundboard program will be handy. You can read its full review here.